JYLBERT - Basque - Bearn - Bigorre. Title : Basque - Bearn - Bigorre.. 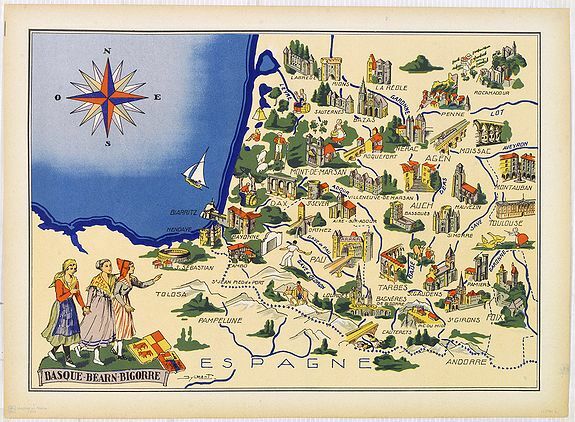 Description :Very decorative, informative map of Basque - Bearn - Bigorre in south western France. Including the towns of Biarritz, Dax, Bayonne, Lourdes, etc. The map is filled with buildings, animals, a boat, figures and three local beauties in their typical dress. With a large compass rose in upper left corner. In cluding the Spanish Bask town of st. Sebastian.